Ice City winter sports and entertainment complex is erected in the center of Tashkent. A media tour was organized for journalists on the eve of Ice City opening. Opportunity is created for playing hockey, and skating in a unique indoor park with a total area of about 16 thousand square meters. Snow hills and special snow-covered grounds help to plunge into the real winter atmosphere. An opportunity is also created for playing snowballs and snowboarding for children. There are all conditions for meaningful family leisure. It will become possible to feel the real winter not only in spring and autumn, but even in summer. Teenagers and young people can feel like real Vikings, visiting a special river water corridor of the Vikings. A special cable car along the corridor will allow to watch the entire complex from above. The ice zone for hockey fans takes up 1,800 square meters. 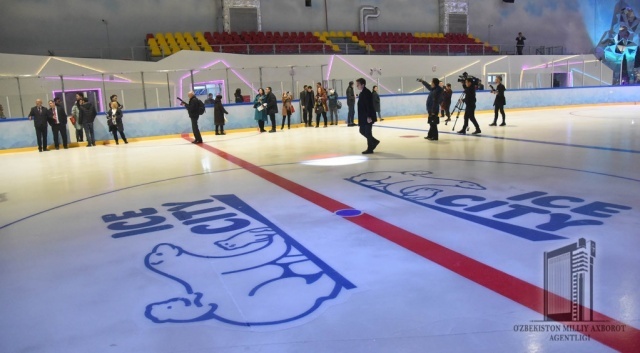 This area, with a size of 60x30 meters, fully meets the Olympic requirements, so the Hockey Federation of Uzbekistan plans to hold the first ice hockey championship in the new complex. It is worth noting that construction of the complex was carried out in a record short time, in a year. Natural ice and snow are used here. The average temperature of the complex is 18 degrees Celsius. The official opening ceremony of this unique complex is scheduled for February 1. On this day, the first Uzbekistan championship in hockey starts. From February 2, the complex will start providing its services to residents and guests of the capital.